Spelling. Are you looking for Ophididae? What does aphididae mean as a name of something? "Aphididae" is a book by Ryoichi Takahashi. 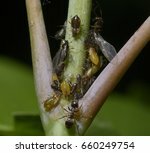 also known as "Aphididae, 1918-1941"
[Hemiptera:Aphididae]: A monophagous aphid endemic to Palearctic; introduced into North America where high populations and consequent honeydew are a nuisance. See Aphididae. The value of this 9-letter word is 16 points, but it's not an accepted word in the Official Scrabble Players Dictionary. Go to the thesaurus of Aphididae to find many related words and phrases! This page was last modified on 12 April 2018.